Agricultural production therefore needs to be cost-effective and directed at key opportunity areas, particularly in export markets where competition thrives. “South African agricultural producers are often unaware of potential export markets for their products,” said Prof Wilma Viviers of the Trade and Development (TRADE) research focus area at the North-West University (NWU). Prof Wilma is the chairperson of the World Trade Organisation research chair and was a keynote speaker at the recent Agbiz Congress 2018 held in Port Elizabeth. “Also, trying to identify the best markets for their products using conventional research methods can be prohibitively costly and time-consuming if they are small to medium-sized organisations with limited financial and human resources,” she added. The Agbiz Congress 2018, which attracted some 400 delegates, had the appropriate theme of ”Uncertainty creates opportunity”, serving as a reminder that even uncertain times can be effectively leveraged if people adopt a problem-solving attitude. Prof Wilma, together with PhD student and fellow keynote speaker, Martin Cameron, spoke about the work that the TRADE research focus area has been doing over the years in the area of export promotion and export market selection. This includes the development of an innovative and user-friendly software tool called the TRADE-DSM (Decision Support Model)® which pinpoints the most realistic and promising export markets for given product categories. The model has particular relevance for the agricultural sector, which is subject to changeable market conditions and fluctuating demand. South Africa’s Integrated National Export Strategy (INES, 2015) places strong emphasis on growing the country’s export volumes through the diversification of products, markets and suppliers in those sectors where South Africa already enjoys a competitive advantage. Yet a practical mechanism is needed to turn this vision into reality. Behind the user-friendliness of the TRADE-DSM® is highly sophisticated software that efficiently filters vast quantities of market and product-related information, gleaned from myriad international data sets, to reveal the most promising product-market combinations for a particular country, province or even industry sector. Based on the results, appropriate export promotion and development strategies can be developed, taking into account the relative openness of the identified markets, the prevalence of competition and the markets’ short and long-term growth potential. Export promotion organisations and industry bodies in South Africa and other countries are also using the TRADE-DSM® to inform their export development strategies and support programmes. Explaining the value of the model to the agricultural sector in particular, Prof Wilma said: “Applied across all agro-processing-related products, the TRADE-DSM® has revealed that South Africa has a ‘pool’ of more than 6 284 possible export opportunities with an untapped potential value of US$21 billion. If these opportunities could be successfully exploited, the impact on job creation in the sector would be huge”. The TRADE-DSM® software tool is made available to private organisations and government entities through the NWU spin-off company, TRADE Research Advisory (Pty) Ltd, where much of the ongoing development work takes place. For more information about the TRADE focus area’s research activities, visit: http://commerce.nwu.ac.za/trade or visit: http://www.tradeadvisory.co.za for more details on the TRADE-DSM®. 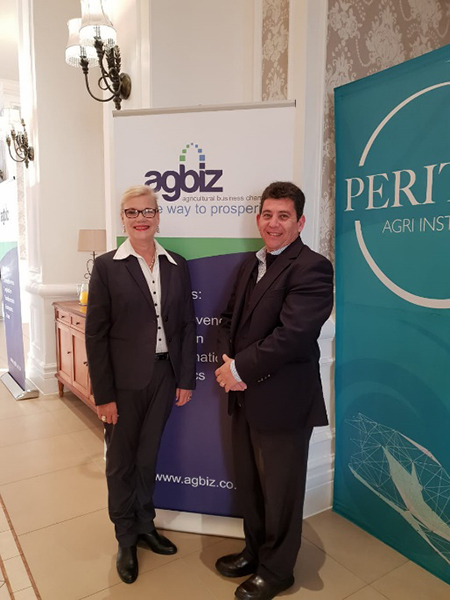 Prof Wilma Viviers and Martin Cameron at the Agbiz Congress 2018 that took place on 7 and 8 June in Port Elizabeth.